The small, green flowers of Pelitory, Parietaria hespera, are arranged close to the stem and below the leaves and thus are very obscure. Observed in the Maricopa Mountains, Maricopa Co., Arizona, USA on 06 March 2010. 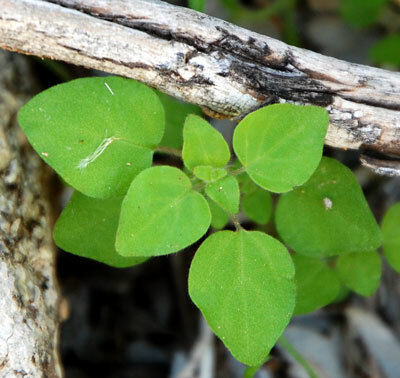 ANNUAL HERB: An ephemeral desert herb of early spring. Rarely exceeding 20 cm tall. FRUIT: Small single seeded capsules enclosed in greenish sepals and bracts. RANGE: Common in Sonoran Desert of Arizona and Sonora mostly in partially shaded spots such as along side boulders or under trees. LEAVES: Triangular leaves are thin. Generally about as broad as long. FLOWERS: Small, greenish and without showy petals. UNARMED: Unlike many members of this family, there are no stinging hairs.